Ulster Rugby has announce that Ireland international lock, Dan Tuohy, has agreed a three-year contract extension with the province that will keep him at Kingspan Stadium until at least the summer of 2018. Tuohy signed for Ulster from Exeter Chiefs in the summer of 2009 and has made 118 appearances for the province so far. The 29 year-old made a try scoring international debut for Ireland against the All Blacks in 2010. He has won nine caps in total and made two appearances in last season’s RBS 6 Nations championship win before injury cut his participation short. Tuohy has also represented Ireland at U21 level and has four caps for Ireland A. Commenting on his new contract, Dan said: “I am delighted to have signed a new contract with Ulster. I have been here almost six years now and although Ulster Rugby has evolved a huge amount in that time we are yet to win anything. 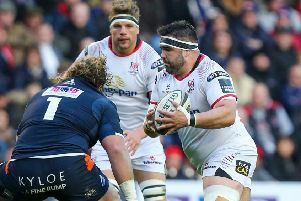 Bryn Cunningham, Ulster Rugby’s Team Manager, added: “Dan is hugely important to us and has developed into a highly effective leader both on off the pitch. He has proven at both international and provincial level that he is an outstanding player in his position. His effectiveness as a powerful ball carrier to break the gainline at important times in matches is crucial in the modern game.